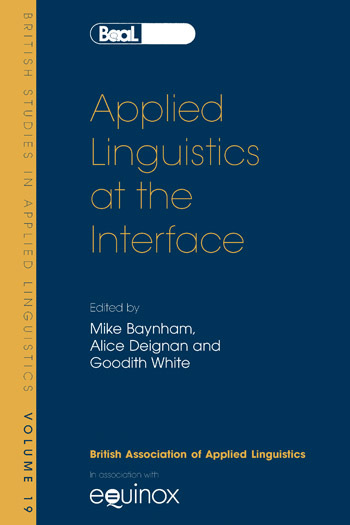 The theme of this volume, a selection of papers from the 2003 conference of the British Association of Applied Linguistics, celebrates the productive interface between Applied Linguistics research and other disciplinary ways of knowing, forms of professional practice and issues of public concern. In the last two decades, the scope of applied linguistic research has broadened considerably to encompass a wider range of topics, issues and settings, drawing on rich and diverse methodologies. Topics covered in this collection illustrate this diversity, including conversational analytic perspectives on computer mediated communication, academic literacies, the sociolinguistics of English in Africa, L1/L2 writing, classroom discourse analysis, the psycholinguistics of second and foreign language acquisition, phonological awareness in second language learning. The contributions, all based on empirical research, address issues of language learning and use in a range of languages: Chinese, English, Italian, German, Greek, Japanese, Spanish.